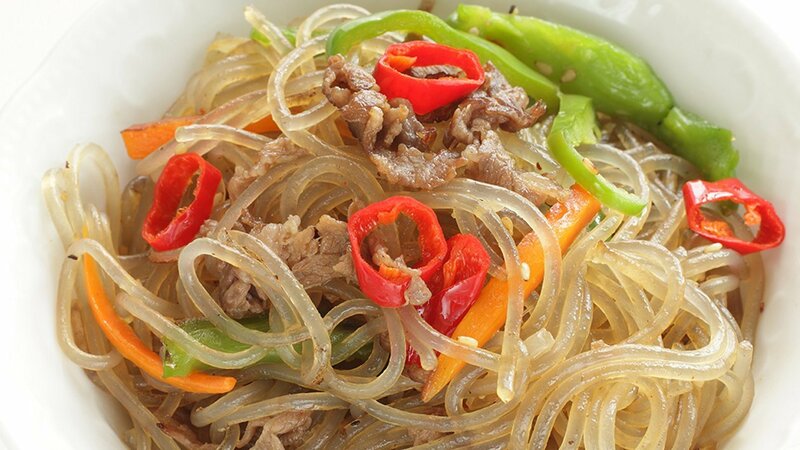 Korean Buffet Dish to delight anyone with a passion for beef. Cut the beef into thin 5 cm long strips. Combine all sauce ingredients in a small bowl and mix well until sugar is dissolved. Mix the beef with 180 ml of the sauce. Cut the stems off the mushrooms, and slice into 0.5 cm thin strips combine with the beef. Stir fry the beef and mushrooms together until the meat is cooked through, 2-3 minutes. Transfer to a bowl and keep warm. Cut the noodles into 15 cm lengths. Mix in 160 ml of the prepared sauce in a large bowl. In a non-stick sauté pan with 45 ml of oil stir fry batches of noodles over medium heat, stirring frequently, until translucent and a bit sticky (about 4 minutes). Transfer into a separate large bowl. Add 60 ml of oil to the pan, and stir fry the onion until translucent over medium high heat, lightly season with salt and pepper. When the onion is almost done, stir in the spring onions and cook briefly. Transfer to the bowl with the noodles. Stir fry the carrot for 1 to 2 minutes until softened. (don’t overcook the vegetables, they should be blanched). Transfer to the noodle bowl. Take the spinach and squeeze out excess water, cut into about 5 cm lengths, and lightly season with salt and pepper. Add the spinach and the remaining sauce to the bowl with all the other prepared ingredients except the beef and mushrooms. Toss well by hand, adjust the seasoning to taste by adding a little more (start with ½ teaspoon) soy sauce and/or sugar. Top with the beef mushroom mix.